April 2014 - Pebbles, Inc.
Hello everyone! 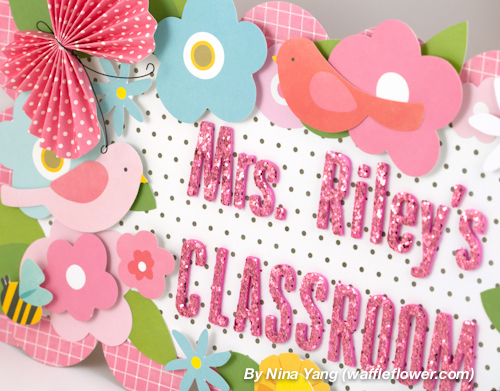 Nina here to share a teacher’s gift idea: a classroom decoration. 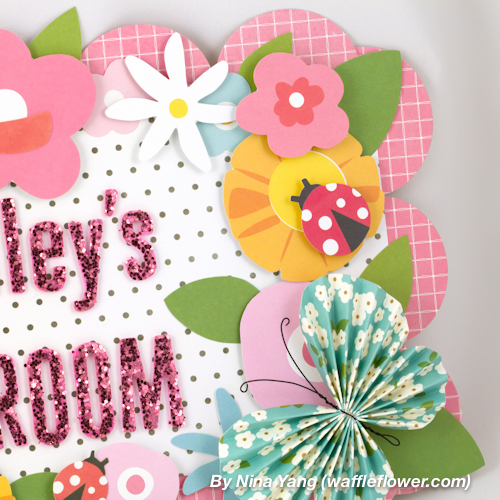 I used the glitter foam thickers to spell the teacher’s name and lots of cardstock shapes and embellishments to create the flower frame. Add some critters here and there for more visual interest. 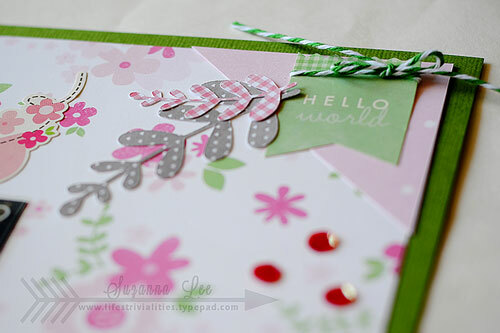 I used two cardstock shape packs but I didn’t need to worry about the color harmony because they are all from the Garden Party collection and are designed to work together. 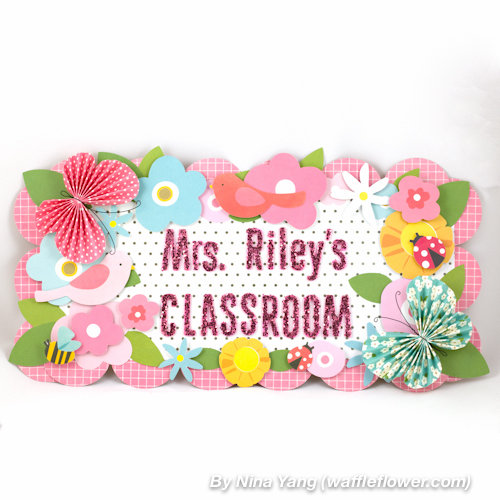 I hope that Mrs. Riley will enjoy this floral frame decoration! You can find more step photos on how I made this classroom decoration on my blog. I love that it can be easily altered for some other home decoration projects too! 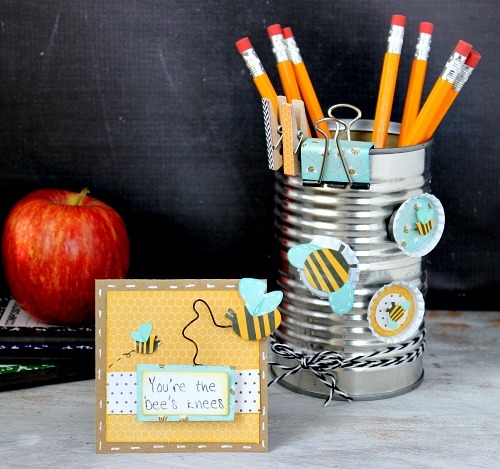 Holly here from Ribbons & Glue sharing with you a DIY Supply Holder and Magnets perfect for Teacher Appreciation Week made out of thePebbles Garden Party collection. For the base of the supply holder, I recycled a soup can and made DIY magnets out of bottle caps by adhering 1 inch circles cut out of patterned paper to the inside of the bottle caps then gluing the caps on to magnets. 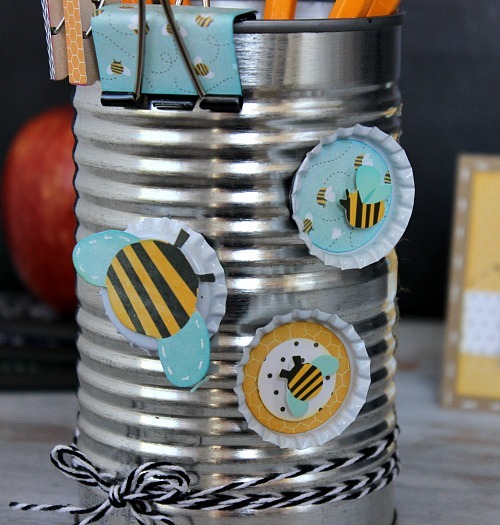 The bottle cap magnets are embellished with Garden Party bee accent stickers and card stock shapes. 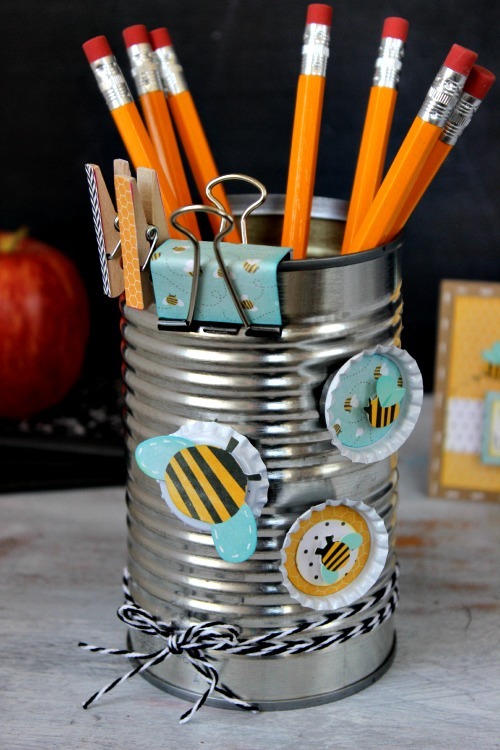 The supply holder also includes coordinating paper clips and cute bee themed clothespins. To make the Teacher Appreciation gift more personalized, I included a coordinating card made out of kraft paper and patterned papers, Garden Party accent stickers and card stock shapes along with a stamped sentiment. Who doesn’t love a fun, themed collection? They’re always so fun to work with. It’s a bit more of a creative challenge though when you repurpose a themed collection and use it in a new way. 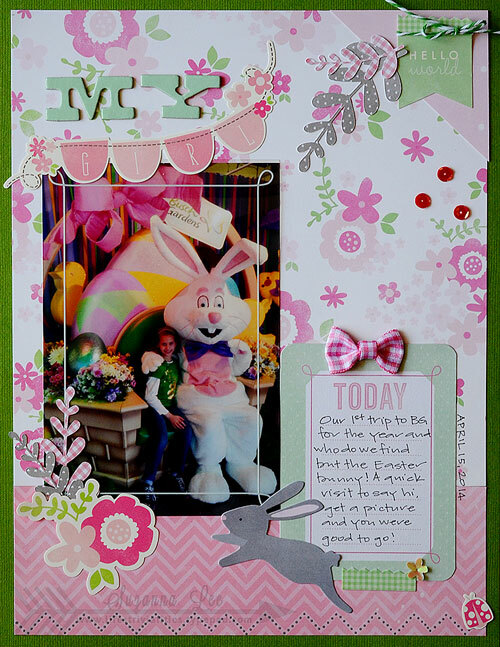 Take for instance the way Suzanna Lee has taken our Special Delivery line and used it to create an Easter scrapbook layout. 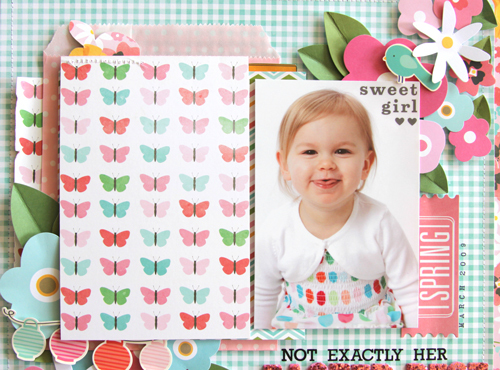 The Special Delivery Girl collection has such lovely soft colors with a bright spark here and there to pull you in. It’s just darling for baby girls. Or Easter bunnies! My baby girl is 7 now, she’s really not much of a baby. But doesn’t preclude me from using this collection! 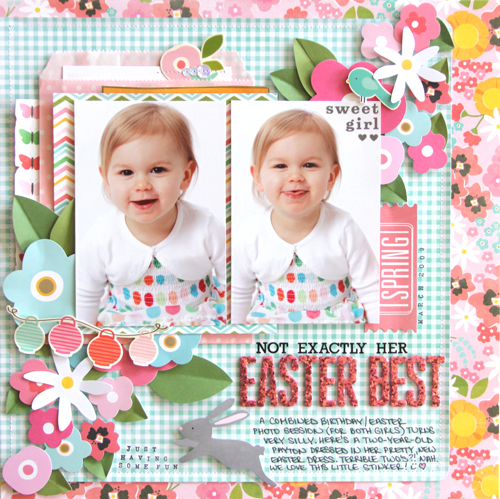 The colors and certain elements are just the thing for this Easter themed layout. Don’t be afraid to re-purpose themed collections. 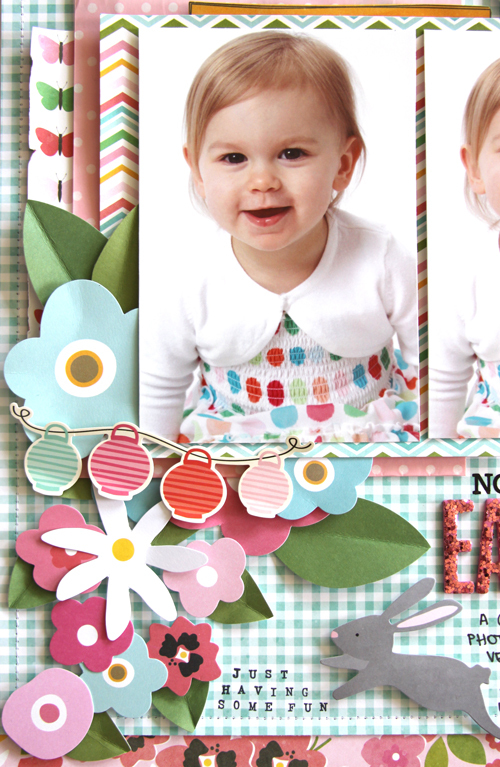 Scan through the embellishments and you will always find some that are generic, more support to the central theme. 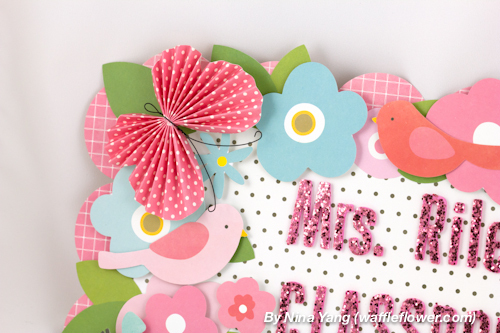 Those are the embellishments and papers that will become central to your re-purposed theme and creation. For example, the rabbit and flowers that I used here. Even embellishments that clearly are particular to the theme can be multi-purposed. 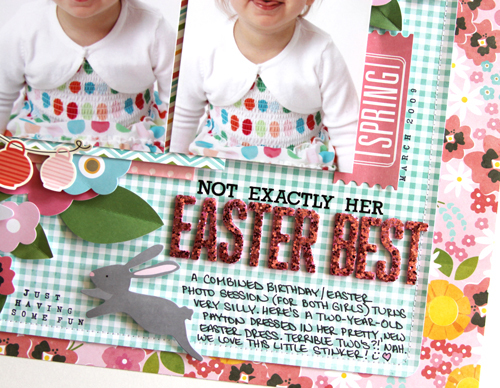 It’s very clear when you think about it that “Hello world” and “Girl” are from a baby collection when you see it with the whole collection and all the cutesy baby sayings and classic symbols of baby (safety pins, rubber ducks, etc) but they don’t look out of place here, on an Easter layout. Think outside of the box; how else can you use things? Don’t be afraid to pull things apart, cover them or the part that is clearly irrelevant as you try to re-purpose either. That little green washi tape looking bit anchoring the journaling tag down is the top of the “Hello world” banner. It was too long for the spot I wanted the banner so I trimmed it to fit. The left over was perfect as a pseudo-washi don’t you think? Don’t be afraid to use a themed collection if it’s not relevant to you for another purpose! 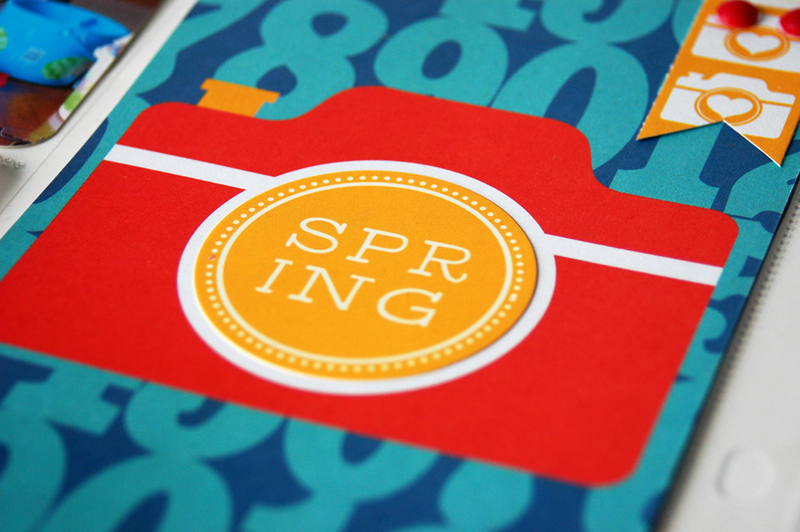 I had another example of re-purposing up on my blog earlier this month. I used the Pebbles Americana collection, a very patriotic, red, white and blue collection to document a swimming event. You can find it HERE if you’re interested. 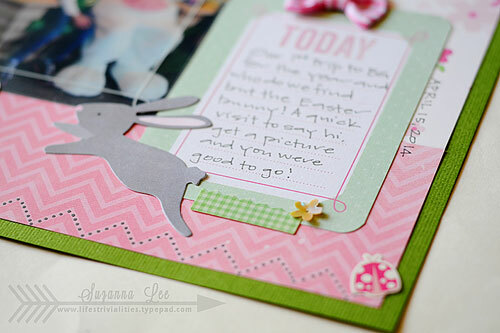 Wendy Sue Anderson is sharing a little Project Life inspired photo pocket page scrapbooking for Easter today. I love using pocket pages for scrapbooking big events where I take a lot of photographs. I usually take a lot (sometimes way too many) photos on holidays – such as Easter. I had a whole stack of pictures from Easter morning so I picked a handful and started filling pockets. The remaining pockets, I filled with fun cards and a few little embellishments. 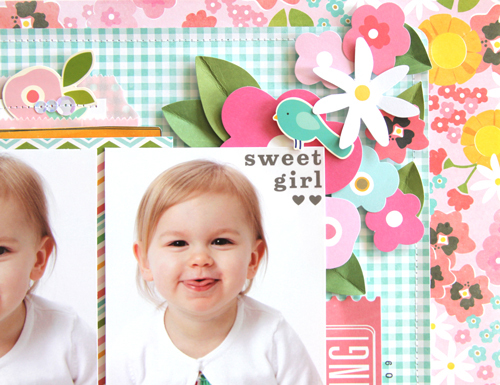 Pocket pages are the perfect way to include lots of photos and still be as creative as you want to be! 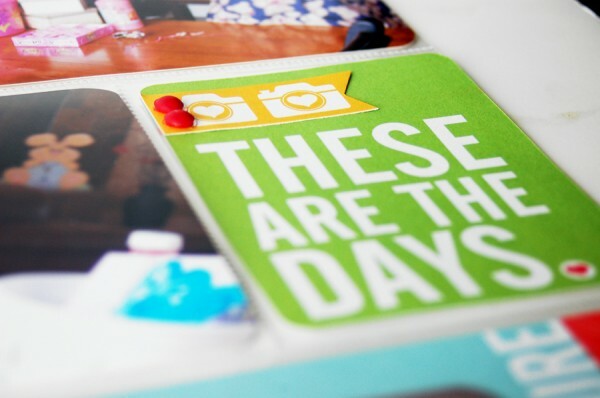 * Tip: Usually you’ll find pastels and soft colors in spring and Easter collections – but, as you can see, my photos did not include soft colors or pastels – so I opted to step out of the traditional box and use some fun, bright colors to scrapbook these photos! Do you remember putting on your Easter best? What a sweet moment to capture! 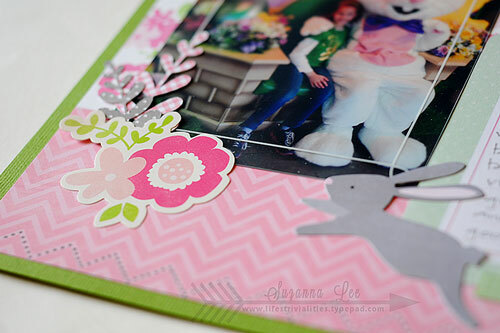 Check out Renee Zwirek’s bright and cheery Easter scrapbook layout. Easter is just around the corner. Celebrating the holiday with family, decorating eggs and sharing them, eating lots of candy, and having egg hunts. A wonderful day! 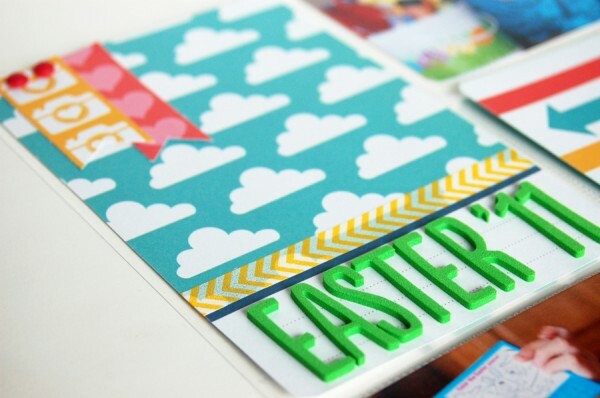 I made an Easter layout that actually has nothing to do with any of those fun activities. 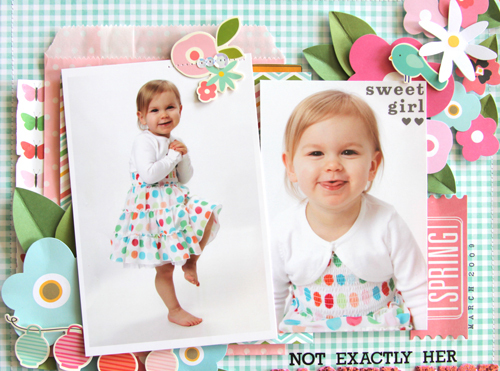 Instead, I made a layout with photos from a spring photo session with a very two-year-old, Payton. This kid cracks me up. Oh sure, she’s a little sweetheart. But, you can see her little stinker side here. I used lots of items from the Garden Party collection for my layering. 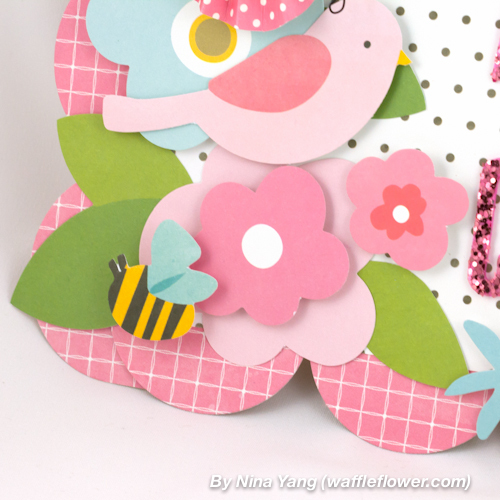 Pattern papers, a printed bag, stickers, tags, and my favorite…flowers! 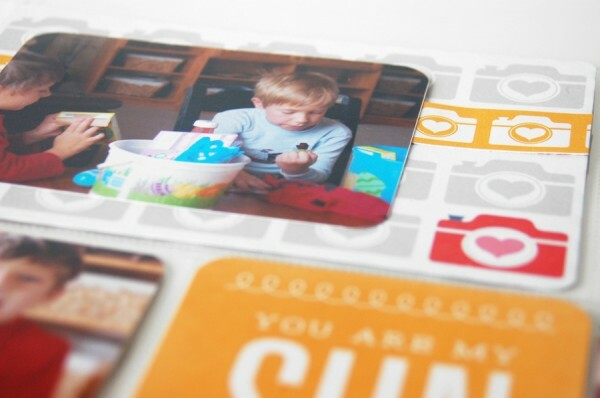 And, how great do these colors look with my photos?! It’s a perfect match. I get so excited about things like that. I added a hippity hoppity bunny just for fun. Normally, I don’t like to use my handwriting on my projects (I prefer a pretty computer font). But, I thought it would be a nice change here and the girls can enjoy it (my trademark smiley face). I added another fun photo of Payton inside the printed bag. Of course, I used a flower sticker as the pull tab for easy access to it.